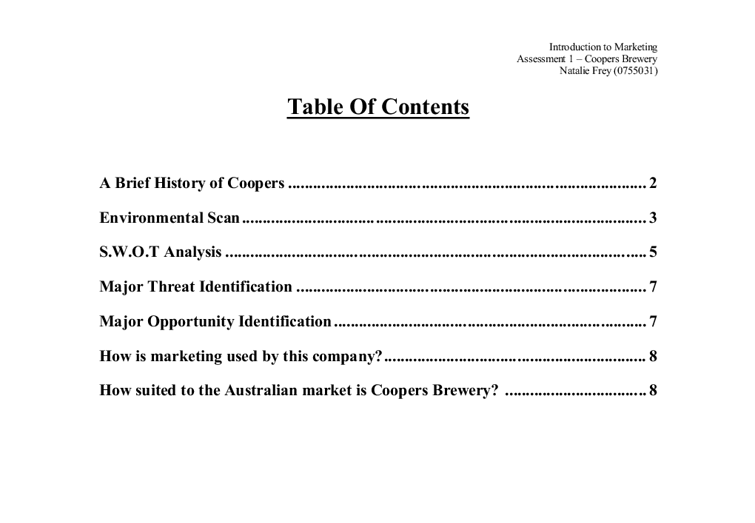 Table Of Contents A Brief History of Coopers 2 Environmental Scan 3 S.W.O.T Analysis 5 Major Threat Identification 7 Major Opportunity Identification 7 How is marketing used by this company? 8 How suited to the Australian market is Coopers Brewery? 8 A Brief History of Coopers The name Coopers is synonymous with South Australia and, in the opinion of many Australians, it is also synonymous with phrases such as "great-tasting beer" and "family owned". In 1862, many South Australian colonials came to appreciate the taste of Thomas Cooper's Best Extra Stout and Sparkling Ale. Thomas had originally brewed these beverages to give to his ill wife for medicinal purposes. In 1881 however, due to his brew's rapidly increasing popularity, Thomas opened his first brewery at Leabrook in S.A. Coopers have since come to be regarded as a very distinctive brewery. Years after the death of Thomas Cooper, his company and its legacy have been handed down from generation to generation. In the present day, 140 years since the creation of the Coopers brand, it is the last family-owned and operated brewery in Australia. ...read more. majority of pubs and bottle shops stock their full range * Strong customer relationships, relates to marketing activities such as the Coopers Club which has a strong customer focus * Australian made Another Coopers' point of difference is their extremely high quality ales and stouts. This means that they are widely perceived by the public as a distinguished, superior brewery. S.W.O.T Analysis Internal Factors Strengths Weaknesses * Considered to have a superior taste * South Australian owned and operated * Very profitable organisation, lots of internal wealth * Strong branding * Focus on niche markets * Family owned and operated * Value prices for high quality products * Large range of different beers * Own line of Coopers' merchandise * Ales have no additives or preservatives * 140 year history * Coopers have premium market segment * Diverse range of promotion and sponsorship * South Australian owned and operated * Family owned business * Myopic attitudes of potential customers * Taste considered superior by some may be disliked by others * Equipment costs required to package and produce beer * Adequate production scale * Smaller marketing budget than bigger breweries * Smaller distribution network External Factors Opportunities Threats * New technology ...read more. Coopers Brewery has proven that they are very suited to the Australian market, above all other markets. They have proven this with their marketing aims and strategies, which are visible in their advertising, which is very Australian-focussed. Coopers use of Australian slang in their advertisements has also proven popular (eg. "We've done the old man proud" is a slogan used in a Coopers advertisement promoting the ongoing legacy of Thomas Cooper). Coopers has the potential to be suited to most markets both Australian and overseas. Their suitability to a market is namely controlled by their marketing and promotion mix, and their target segment. It's easy to be suited to a "beer drinking Aussie market", when your advertising targets "beer drinking Aussies". Coopers however, has researched segments and developed products to suit a wide cross-section of different types of people, from young women (Heritage Premium Ale), to old men (Best Extra Stout). Coopers brewery have thoroughly proven their suitability to the Australian market, and they have also proven that they have what it takes to 'survive amongst the giants.' Reference List Rix, P 2004, Marketing: A Practical Approach, McGraw Hill, NSW. Coopers student information Booklet (PDF) Sourced from: http://www.coopers.com.au/students.php ?? ?? ?? ?? 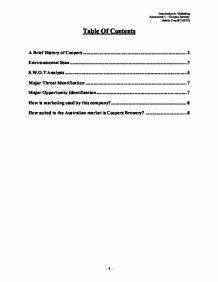 Introduction to Marketing Assessment 1 - Coopers Brewery Natalie Frey (0755031) - 1 - ...read more. Another strength is how well they are doing in the market, which I will be able to find out from my primary data. Finding the strength of an product is important to an organisation as it allows them to see what they are good at and what their customers are happy with. Nevertheless, we should admit that advertising actually enriches our lives. Commercial television is able to provide us with free programmes thanks to its advertising revenues, local newspapers and magazines derive also much revenue from advertising, which allows them to exist. PRODUCT DEVELOPMENT - This is a new product to be marketed to the firms existing customers. Here the firm develops and innovates new ideas/product offerings to replace the older products. DIVERSIFICATION - This is where a firm develops and markets a completely new product to a new audience. infected users will grow according to a logistic curve, whose initial segment appears exponential. A logistic function or logistic curve models the S-curve of growth of some set P. The initial stage of growth is approximately exponential; then, as saturation begins, the growth slows, and at maturity, growth stops. After the Second World War, with a deep decline in mass transit and a rapid growth in private cars, advertisements shifted away from such mundane qualities of autos. The new message: the right car can satisfy presumed or fabricated human "needs" (mostly just "wants"). Again, to capture this buyer, we would have to get our tires to the preferred store and have aggressive pricing at all stores. Since our product is higher priced, we probably will not get many Commodity buyers purchasing the Aquatred tire. It does not involve the sale of things through a shop or a department store. Calvin Klein is likely to be advertised in department store magazines for example Boots. Calvin Klein do not use this method, if a department store was distributing magazines then they would have to ask Calvin Klein for permission before they distribute the magazine.